Iridium is a metal. It is very hard to find and costs a lot. It is known as a "noble metal". Iridium belongs to a group of metals known as transition metals. It looks like platinum and is found in asteroids and comets. It can be used to find out when an asteroid or comet will hit the Earth. It is a very costly metal that can fold and bend just like aluminum. It is very shiny. It is relatively rare on the Earth's crust. 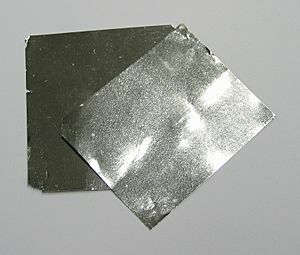 Most Iridium is found in Brazil, Canada, Myanmar, Russia, South Africa, and the United States. Iridium is the most corrosion resistant metal. Iridium melts at 2410 °C and boils at 4130 °C. Iridium Facts for Kids. Kiddle Encyclopedia.